Size is 3-13/4"h. x 3 1/3" in diameter at the widest point. Note the footed base and the sets of concentric rings on the lid . . . a nice embellishment. This lid is different than we usually see, with two of the rings cut wider and deeper and flanked by scribed lines. When the pioneers began building homes and communities, they had many needs, some of which involved the safe storage of food which was vital to their survival. Secure containers were indispensable to protect food from pests and to keep dry such essentials as herbs, mustard and other seeds, salt, pepper, and maple sugar chunks. To fulfill these needs, David Mills Pease introduced a new style of spindle-turned woodenware that surpassed other regional designs. He possessed an inherent aesthetic sensibility nurtured by exposure to historic Connecticut River Valley refinements. The impact of visual resources of 18th and 19th century high-style furniture is reflected in Pease forms. Those items made by him and his family are very distinctive and rank among the best of the best in design, form and aesthetic beauty. 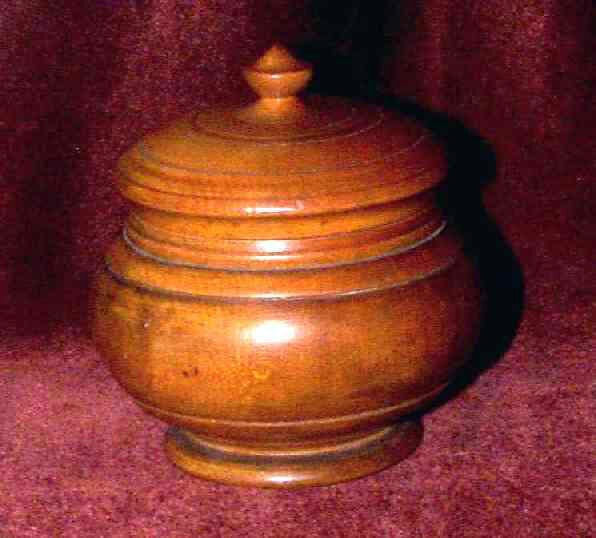 Peaseware is Treen at its very finest and widely sought after by collectors as well as museums. While David Mills Pease was born in Deerfield, Massachusetts in 1815 and moved to Ohio in 1838 it wasn't until 1850 when records show him in Cascade Valley, Ohio where he began his new business of turning woodenware. The rest is history. We are pleased to offer this fine Peaseware Covered container in absolutely wonderful condition. They just don't get much better than this. Excellent original surface and a great patina that only age can impart.